My late father was pretty advanced in his journey with Alzheimers when I read that AD patients respond well to animals. We got my Dad a little Maltese Poodle and it was love at first sight. My Dad absolutely adored Tiger. He carried Tiger everywhere and Tiger sat with him, ate with him and slept with him. Dad did not remember the name of his beloved dog but he knew that the dog was loved, nurtured and spoilt! Location is very important to the eagle and it’s young. If possible, eagles build their nests on the face of cliffs. They don’t build a nest in a tree unless they absolutely have to, because a nest in a tree can be easily accessed. They don’t build it on the top of the cliff, either, because on the top of a cliff it can be violated, too. 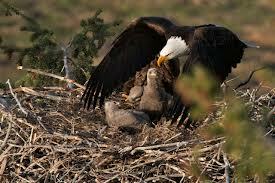 Eagles build their nests in some inaccessible place. The nest is built with consummate skill—not using little twigs, but great branches woven together in an immensely skillful way. If somehow an eagle’s nest is loosed from its moorings and falls, it rarely comes apart. In fact, eagles’ nests are so big, they have weighed in at half a ton! They’re comfortable, too. Their centers are carefully lined with feathers and leaves, and the eggs are placed there. When they hatch, the mother begins the process of feeding the babies. After the eaglets get to a certain size, or maturity, everything changes! One day the mother eagle comes back from being gone, but this time there’s no food in her beak, and she doesn’t land on the edge of the nest. Instead, she hovers over the nest. Why does the mother do this? She is demonstrating that those curious appendages on the babies’ backs have a useful function. Eagles, of course, were meant to fly, but they don’t know that. If we take an eagle and separate it at birth from its parents, it will never learn to fly. It will just grovel around in the dirt like a chicken. It might even look up and see eagles soaring overhead and never guess that it was meant to soar in the heavens. Eagles have to be taught, and that’s the mother’s job. So first she just demonstrates. All at once she pushes the little one out of the nest, and the eaglet falls down the face of the cliff, surely to be destroyed. But not so! In a flash the great mother eagle flies down, catches the little one on her back, and flies up and deposits it in the nest. (“Whew! Mom, that must have been an accident.”) But it wasn’t an accident. The mother bird pushes the little one out again, and again, over and over. Why would a mother do that to her young? Does she hates the little one? Not at all. It’s just that those little birds were made to fly, and they don’t know it, so she is going to push them out of the nest. She never lets them hit bottom, but she does let them fall, because they have to learn something they don’t know. The next time the mother bird comes back she decides to clean house, and so she stands on the edge of the nest. The first things to go are the feathers inside; she drops them over the edge. Then the leaves go over the edge—heave ho! While this is going on, she’s not very talkative, either. (“Mom, what are you doing?”) She pays no attention. Since she built the house, she knows how to take it apart. She seemingly pays no attention to the concerns of her young as she prepares to pull the nest apart, for she is determined that those little ones will fly, and she knows something they don’t. She knows they will never fly as long as they remain in the nest. That is why teenagers and mothers fight…so they can learn to fly and “escape” home! We all go through this stage with our teenagers. Most of the time we don’t even realize the process…. But Nature is great and takes over from us. That is the mother I was! I mothered (smothered) my precious baby until her last breath. I do not regret that she never learnt to fly. Hell, she never even learnt to ride a bike! I just feel so lost and empty. A very good example! Now, if mothers of grown children would just learn that!!! A few need to be thrown out of the nest. You are not alone. We are here for you. Tersia, this is so touching and true. But beyond this, I am inspired to write something for you. You will read my words soon. You allowed Vicky to fly farther than any eagle mom could. You have no idea. Tersia my friend I wish I knew what to say to your feeling of loss and emptiness. It is so very hard to know even though we walk the same path of grief what to say , I have found strength in the Lord and if you don’t mind I will share this with you. “He gives strength to those who are tired and more power to those who are weak. the people who trust the Lord will become strong again. they will rise up as an eagle in the sky: ; they will run and not need rest; they will walk and not become tired” Isiah 40 : 29, 31 I also like Matt 11:28-30 and Psalm 46:1, 11 they helped me. The eagle story is fascinating and is a wonderfully helpful analogy. Thank you, Tersia and please know how much you are in my thoughts. Great analogy! I agree with the other reader that at a certain age children should leave the nest. However, I also feel the doors of home should always be open, for that is what home is all about. Tersia, you continue to remain in my thoughts and prayers…Hang in there! inspiring, as always. God bless. The dog story was so sweet! <3 The eagle one was nice too. Hmm…an eagle or a dog. I think I am a dog. If I was meant to fly…I have no idea.